Oprah is challenging you. Are you up for accepting the job? No meat, no milk, no animal anything. 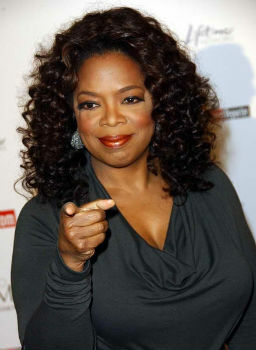 Oprah and 378 Harpo staffers go vegan for one week. This is an episode you’ll want to make sure to catch, and to tell all your friends and family about. Set your recorders now, and forward this on!! This is the year vegan will officially go Mainstream!! TUNE IN, FEBRUARY 1, 2011 to watch the show. Guests on the show will include the terrific vegan advocate Kathy Freston and anti factory farming author Michael Pollan. Reporter Lisa Ling will give us an inside view of a “beef processing plant” i.e. slaughterhouse. The more enthusiastic support Oprah gets the better, so please join the discussion. And please send the Oprah show a separate note of support where the show take comments (some of which are read on air.) You can check here to see when Oprah airs on your local station.